After earning my Bachelor of Science degree in Applied and Engineering Physics from Cornell University, I went to work for The United States Patent Office as an examiner. I had not been there long when I went to hear a presentation by Richard Buckminster Fuller. He spoke about environmental politics and geometry. Back at the Patent Office, I read all of Fuller’s patents and started building models of some of his architectural innovations. I left DC to help develop environmentally sustainable technology at The New Alchemy Institute on Cape Cod. I am still involved in that work through an organization called Seeds of Solidarity. Meanwhile, I continued to experiment with Fuller’s ideas, especially a structural concept he called Tensegrity. 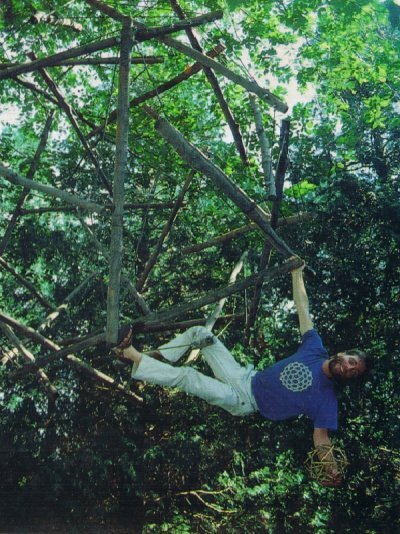 Here’s a photograph of me hanging from a tensegrity sculpture I designed, built, and installed for The Omega Institute in New York State. I also founded a company called Integrity Designs, Incorporated. 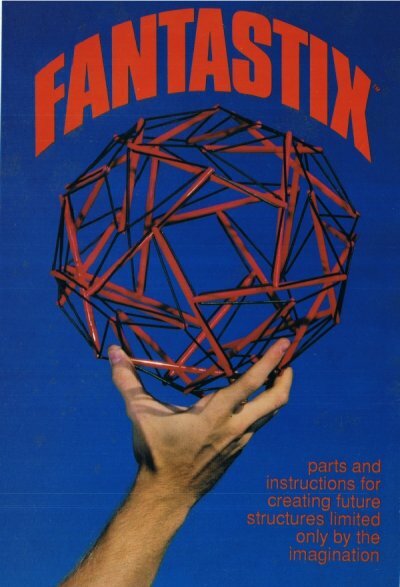 Through this company, I designed, manufactured, and marketed an educational construction toy called FANTASTIX. Here’s the cover artwork from the packaging. FANTASTIX sold in over fifty different stores and catalogs. There was no Internet to speak of at the time, but the product sold mostly in teacher-supply catalogs and museum shops. It was also on the list of required materials for a Design Science course at Harvard University. The FANTASTIX experience kindled my interest in education. I went back to school and earned a Master of Arts degree in Curriculum and Teaching, this time from Michigan State University. This was followed by thirteen years of teaching mathematics in high school and community college. When not teaching, I was often working on a computer animation project called Platonic Solid Rock. So that brings us up to the present. Platonic Solid Rock has been released. I hope you enjoy it. I spent the past three years writing and editing teacher certification exams for various states. I am now embarking on a new project helping to create a pre-engineering academy within an inner-city high school. We are hoping to inspire students and breathe new life into this struggling school. Postscript: The academy is in its fourth year and doing very well!